According to their website, The School of Fine Art organises research- focused symposia, publications and cross school lectures and tutorials with guests in 2015 including Jake Chapman, Urs Fischer, Andy Holden, Francesco Manacorda, Gordon Cheung, Emma Hart and Rose Wylie.This all contributes to a dynamic art research culture evolved through seminars, symposia and exhibitions, and conducted at individual and group level. Staff and student research is supported by world-class facilities including a full range of well-equipped moving image, performance, computing, photography, printmaking and sculpture workshops, all staffed by highly skilled technicians. According to their website,"Parsons School of Design has offered students innovative approaches to education since its founding in 1896. Today we’re the only American art and design school within a comprehensive university, The New School, which also houses a rigorous liberal arts college and a progressive performing arts school. Our undergraduate and graduate programs, offered through Parsons’ five schools, immerse students in focused training, interdisciplinary inquiry, and practice-based collaborative learning. Here creators and scholars master established art and design fields and advance emerging ones while studying a range of university disciplines. According to their website,"Founded in 1877, Rhode Island School of Design (or RIZ-dee” for the acronym RISD) is one of the oldest and best-known colleges of art and design in the U.S. Each year approximately 2,300 students from around the world pursue a creative, studio-based education at RISD, which offers rigorous bachelor’s and master’s degree programs in 19 architecture, design, fine arts and art education majors. 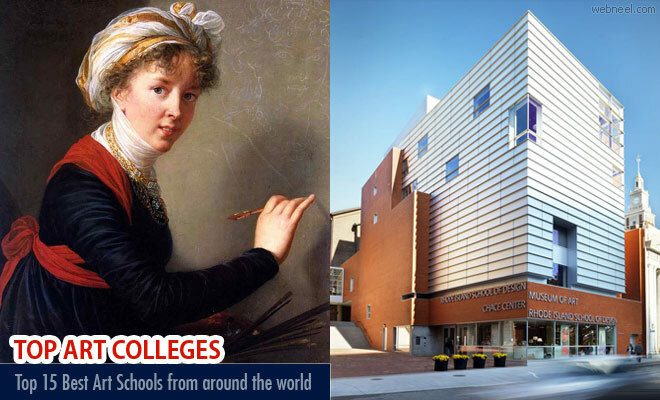 The college is located in Providence, Rhode Island, which offers its own vibrant art scene and is conveniently located between two other major cultural centers: Boston and New York. According to their website,"Pratt provides one of the most comprehensive professional art educations available, supported by a distinguished faculty and exceptional technical and studio resources. Gifted students from across the United States and the world collaborate and learn at Pratt, weaving creative energy and opportunity into an unmatched educational experience". School of the Art Institute of Chicago (SAIC) is one of the most historically significant accredited independent schools of art and design in the nation located in one of the greatest American cities. SAIC is distinct in the way that it provides graduate, post-baccalaureate, and undergraduate students an interdisciplinary curriculum and the necessary freedom to develop as artists, designers, and scholars. The California Institute of the Arts is a private university located in the Valencia neighborhood of the municipality of Santa Clarita in the California county of Los Angeles. It was incorporated in 1961 as the first degree-granting institution of higher learning in the United States created specifically for students of both the visual and the performing arts. It is authorized by the Western Association of Schools and Colleges (WASC) to grant Bachelor of Fine Arts and Master of Fine Arts in the visual, performing, and, since 1994, literary arts. University of the Arts London is in the top 5 universities in the world for art and design.The University draws together 6 renowned colleges, each with its own world-class reputation. Their state of the art facilities include workshops with letterpress machinery, studio theatres, gallery space as well as libraries and archives for research into hundreds of years of the greatest artists and designers. ArtCenter College of Design is a nonprofit, private college located in Pasadena, California. Edward A. “Tink” Adams was an advertising man with a radical idea in education: to teach real-world skills to artists and designers and prepare them for leadership roles in advertising, publishing and industrial design. The viability of the idea he and a small group of colleagues launched was quickly proven. Even in the midst of the Great Depression, ArtCenter graduates quickly found employment. According to their website, "The GSA is internationally recognised as one of Europe's leading university-level institutions for the visual creative disciplines. Their studio-based approach to research and teaching, brings disciplines together to explore problems in new ways to find new innovative solutions. The studio creates the environment for inter-disciplinarity, peer learning, critical enquiry, experimentation and prototyping, helping to address many of the grand challenges confronting society and contemporary business". The University of Florida is an American public land-grant, sea-grant, and space-grant research university on a 2,000-acre campus in Gainesville, Florida. For the Class of 2020 (enrolled fall 2016), Florida received 32,026 applications and accepted 13,624 (42.5%), and the actual enrollment goal is approximately 6,700. For those admitted the average grade point average was 4.35, an average SAT score of 1918, and an average ACT score of 30. The Department of Art and Art History offers undergraduate and graduate study within a strong liberal arts program in a private University setting, bringing together talented students and a faculty of highly regarded professional artists and art historians. Central Saint Martins is a constituent college of the University of the Arts in London. It is considered one of the world’s leading institutions in art and design education. The college offers nine different areas of study to students, including Graphic Communication Design, Fine Art, and Jewelry and Textiles. Students are encouraged to develop their ideas beyond the accepted boundaries of each artistic discipline and to always be open to new approaches and ideas. Facilities include digital fabrication studios, letterpress studios, a digital media lab, an animation lab, and more. The Berlin University of the Arts is the largest art school in Europe. Its faculty includes some of the most well-respected contemporary artists in the world, including Chinese artist and social activist Ai Weiwei (watch the documentary Ai Weiwei: Never Sorry about his work - it’s super interesting). There are four colleges within the University system that specialize in Fine Arts, Music, Design, and Performing Arts. Berlin University of the Arts has more than 170 international partnerships with other universities. The university hosts over 500 events every year and is a key cultural venue in the city. Students present their work to the public in exhibitions, concerts, dramatic productions, evenings of song, readings, and lectures. The China Central Academy of Fine Arts is one of the most selective schools in China and is considered China’s most prestigious art academy. It is made up of six specialty schools: the School of Fine Art, the School of Chinese Painting, the School of Design, the School of Architecture, the School of Humanities, and the School of Urban Design. The School of Design has been heavily involved with national Chinese design projects, including designs for the 2008 Beijing Olympics. The Academy is also home to a huge museum that includes over 2,000 Chinese scroll paintings that date back to the Ming Dynasty. The National School of Fine Arts holds 450,000 items in its collections in the form of books and artworks; this is one of the largest public collections in France. Faculty and alumni include many internationally recognized artists. The five-year curriculum is made up of two consecutive “cycles”, the first lasting three years and the second two years, in which students learn the fundamental practical and theoretical components of artistic creation.